: I hate schools booking the pool! Well, I should clarify that just a little, I don't hate schools per se but whenever I am on lifeguard duty, every time I have to set up the pool for a school booking, I get this tight feeling in my gut. Tension because I have no idea at the level of swimming ability of the students and worse the level of competence of the teachers/coaches. It's normal for the school sports teacher to run the program but sometimes I just want to go up to them and say "could you have at least read a book on swim coaching or even just swim teaching before you booked the pool lanes"? Seriously! It is terrifying to watch. Not all the time but enough times to be very stressful for a lifeguard; especially one who is a swim teacher as well. 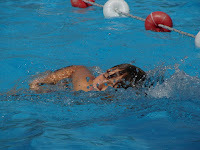 I know that one of the electives that physical education teachers can do here in Australia is an Austswim Certificate. This is a very highly regarded teaching certificate that qualified someone to teach swimming. However, it would seem that is not mandatory to have that qualification to run a school swimming sports program. Even if the teacher that is running that program has the qualification there is no guarantee that they have kept it current. There are also other qualification that can be obtained but I have no idea if schools are even required to have someone in charge of the program, who is qualified. If they are it is not always reflected in the quality of schools approach to their swimming program. At least not the ones I see. To be fair, Not all school frighten me like this. There are schools that come back regularly and as soon as I hear their name I breathe a sigh of relief. Still, they are not the majority; as much as I wish they were. And lets not even get started about the poor teaching and training techniques.